Simpson Bay Resort & Marina is located at Simpson Bay, midway between Philipsburg, the Dutch capital and Marigot, capital of the French quarter. 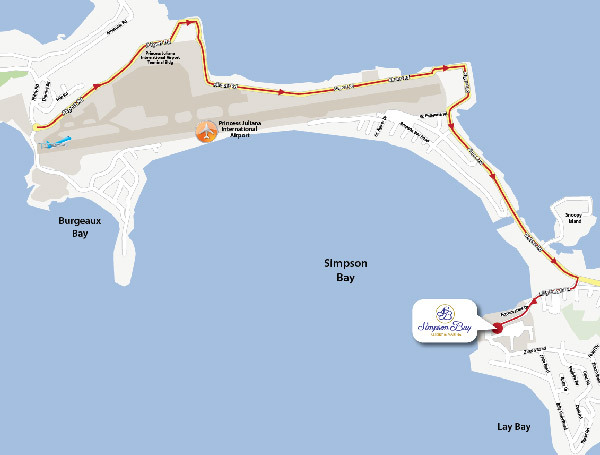 The Princess Juliana International Airport is a 15-minute drive away. Simpson Bay Resort & Marina is located on St. Maarten, the smallest island in the world to be shared by two nations: The Netherlands (St. Maarten) and France (Saint Martin). You do not need a passport to cross the border between the territories and when you do decide to go exploring, you'll find that each one has its own charm. In fact St. Maarten/Saint Martin is a melting pot of French, Dutch and Caribbean traditions with a dash of world culture thrown in for good measure. A winning combination of beautiful scenery, pristine beaches, excellent year-round weather, water sports, shopping and fine dining make St. Maarten/Saint Martin a perfect vacation choice.